On Sunday, June 3, Guatemala’s Volcán de Fuego—“Volcano of Fire”—erupted, spewing dangerous ash, gases, and lava from its 12,346-foot summit. To date, various news sources have indicated that at least 109 persons have been killed. Media coverage has shown footage of the massive and tragic devastation through the week, and now Church of God Ministries has heard from the Church of God in Guatemala. Shortly after the news became available, Church of God Ministries contacted Isai Calderon, national leader for the Church of God in Guatemala. Rev. Calderon spoke about the natural disaster’s unusual impact. “The lands around the volcano are very fertile,” he explains. “Ash is a blessing for cattle ranchers and sugar growers around. [But] there is a fatal attraction to the area. The most recent explosion has not been one tenth of what has been expected for fifty years now. 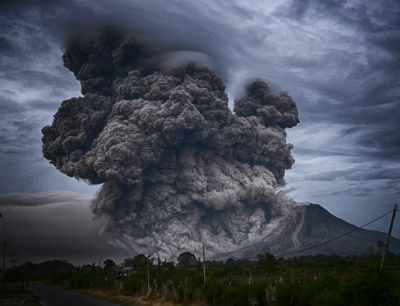 We are supposed to be seeing a Mount St. Helens-type explosion, since it’s a similar type volcano… [but thankfully] it hasn’t happened.” Calderon acknowledged that although there are Church of God congregations nearby, none were directly affected. While we rejoice that people and congregations from the Church of God are safe, we invite you to pause as you see continuing coverage of this volcano and pray for the people, relief workers, and agencies, and the government of Guatemala. Particularly pray for pastors and lay persons within the Guatemalan church to breathe life by into their communities, those affected directly by the volcano and those less affected, by loving, serving and sharing in the name and manner of Jesus. Participate in Church of God relief aid by donating online at www.jesusisthesubject.org/disaster-relief/. Donations can also be mailed to Church of God Ministries, PO Box 2420, Anderson, IN 46018; please note that your gift is for Disaster Relief, Project #45.04502. Thank you! This entry was posted in All Church of God, Disaster Relief, Global Strategy and tagged aid, crisis, Disaster Relief, DRC, eruption, Guatemala, Isai Calderon, John Johnson, Latin America, volcano. Bookmark the permalink.